As NASA continues to give updates on the solar flares this week, they also put together a nice summary of space weather and the effects of those eruptions on Earth. UPDATE: On March 8, 2012 at 10:53 PM EST the sun erupted with an M6.3 class flare and released a CME about an hour later. In addition to the rising geomagnetic storm conditions, active region 1429 has so far produced two X class flares and numerous M-class flares. NASA’s Space Weather Center models measure the CME traveling at speeds of over 700 miles per second and the CME should reach Earth’s magnetosphere early in the morning of March 11. The next phase, the main phase, can last hours to days, as charged particles sweeping into the magnetosphere accumulate more energy and more speed. These particles penetrate closer and closer to the planet. During this phase viewers on Earth may see bright aurora at lower latitudes than usual. The increase – and lower altitude – of radiation can also damage satellites traveling around Earth. The final stage of a geomagnetic storm lasts a few days as the magnetosphere returns to its original state. Geomagnetic storms do not always require a CME. Mild storms can also be caused by something called a corotating interaction region (CIR). These intense magnetic regions form when high-speed solar winds overtake slower ones, thus creating complicated patterns of fluctuating magnetic fields. These, too, can interact with the edges of Earth’s magnetosphere and create weak to moderate geomagnetic storms. Geomagnetic storms are measured by ground-based instruments that observe how much the horizontal component of Earth’s magnetic field varies. Based on this measurement, the storms are categorized from G1 (minor) to G5 (extreme). In the most extreme cases transformers in power grids may be damaged, spacecraft operation and satellite tracking can be hindered, high frequency radio propagation and satellite navigation systems can be blocked, and auroras may appear much further south than normal. Auroras occur primarily near Earth's poles. They are the most common and the only visual result of space weather. 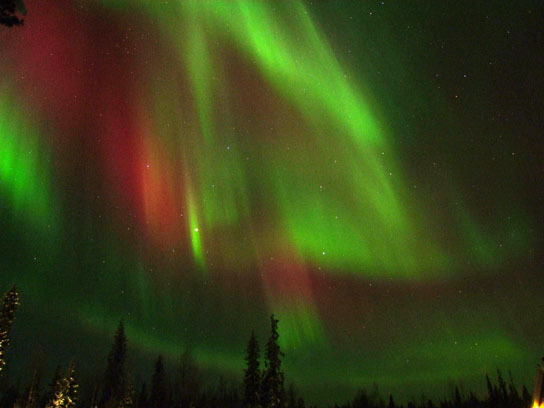 This aurora image associated with solar flares and CMEs on February 23-24, 2012 was taken over Muonio, Finland before sunrise on February 27, 2012. Image Courtesy of Thomas Kast. A solar radiation storm, which is also sometimes called a solar energetic particle (SEP) event, is much what it sounds like: an intense inflow of radiation from the sun. Both CME’s and solar flares can carry such radiation, made up of protons and other charged particles. The radiation is blocked by the magnetosphere and atmosphere, so cannot reach humans on Earth. Such a storm could, however, harm humans traveling from Earth to the moon or Mars, though it has little to no effect on airplane passengers or astronauts within Earth’s magnetosphere. Solar radiation storms can also disturb the regions through which high frequency radio communications travel. Therefore, during a solar radiation storm, airplanes traveling routes near the poles – which cannot use GPS, but rely exclusively on radio communications – may be re-routed. Solar radiation storms are rated on a scale from S1 (minor) to S5 (extreme), determined by how many very energetic, fast solar particles move through a given space in the atmosphere. 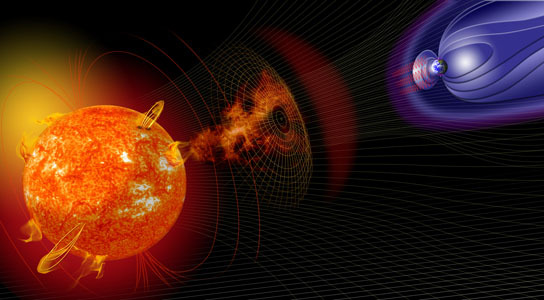 At their most extreme, solar radiation storms can cause complete high frequency radio blackouts, damage to electronics, memory and imaging systems on satellites, and radiation poisoning to astronauts outside of Earth’s magnetosphere. Radio blackouts occur when the strong, sudden burst of x-rays from a solar flare hits Earth’s atmosphere, jamming both high and low frequency radio signals. The X-rays disturb a layer of Earth’s atmosphere known as the ionosphere, through which radio waves travel. The constant changes in the ionosphere change the paths of the radio waves as they move, thus degrading the information they carry. This affects both high and low frequency radio waves alike. The loss of low frequency radio communication causes GPS measurements to be off by feet to miles, and can also affect the applications that govern satellite positioning. Radio blackouts are rated on a scale from R1 (minor) to R5 (extreme). The strongest radio blackouts can result in no radio communication and faulty GPS for hours at a time. 1 Comment on "NASA Continues to Monitor Solar Flares"